This article describes how to install Linux while keeping your other operating system alive. 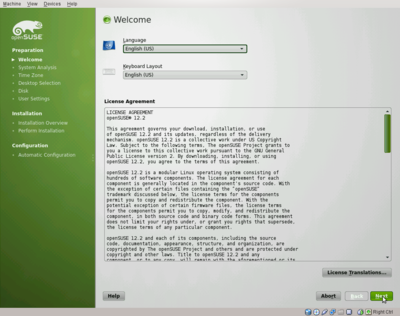 In this example we use a VirtualBox virtual machine and SUSE 12.2, however the chapter "Overview" describes other options that are also possible. You restart your computer and run (boot) one operating system. Life-CDs can be obtained e.g. from http://www.knoppix.org. The advantage is it does not use any space on your harddisk. The disadvantage is you should not save anything on your harddisk. This is the same as booting from a life CD, except that you can write to your Linux harddisk. You install a Linux distribution, e.g. SUSE Linux from www.opensuse.org on your harddisk preserving your original operating system in a special partition. When you boot your computer, you can decide which operating system to boot. Install e.g. VirtualBox from http://www.virtualbox.org and run your Linux in a virtual machine. An advantage is that you do not need to reboot in order to bring up your Linux. You can run two operating systems in parallel. You can even copy from your Linux system to your Windows system. This is the option we will chose in this tutorial. From here you can continue clicking "Next" and filling in the information you would like to. If you are unsure, take the defaults. This page was last modified on 30 November 2013, at 15:26. This page has been accessed 34,685 times.